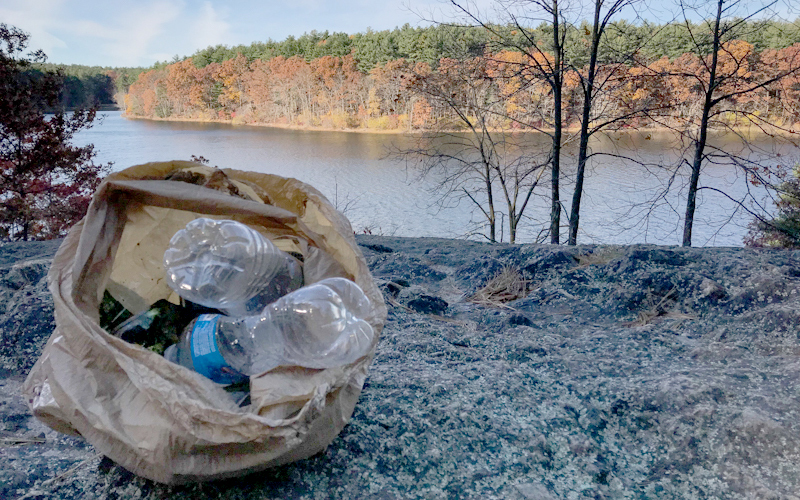 Marc ChalufourThe author tried plogging, which combines running and picking up litter, in Greater Boston’s Middlesex Fells. “Plogging.” It isn’t an attractive word. Did someone feel the need to mash “plodding” with “jogging” because neither, alone, adequately described their pace? That was my first thought when a friend mentioned it in a recent conversation. I googled the word a few days later and was surprised to learn it’s a Scandinavian trend that combines running with, of all things, collecting trash. Inspired, I grabbed a spare shopping bag and headed to the Middlesex Fells for a morning trail plog. A few years ago, I spent a weekend with AMC’s ridgerunners, a small group of summer employees who roam the Appalachian Trail in Connecticut and Western Massachusetts. They monitor trail conditions, help hikers, and, among many trail stewardship duties, pick up trash. After seeing the trail through their eyes, I started making more of an effort to pick up litter on my own hikes. It’s easy enough to do—just tuck a bag in your pocket and keep your eyes open for stray bottle caps and granola bar wrappers. The habit never carried over to my running, despite frequenting suburban trails often scattered with litter. Who wants to stop every 10 meters? Not to mention the awkwardness of carrying a bag of rubbish in one hand. According to the Washington Post, though, collecting trash and working out at the same time is now a full-blown fad in Sweden (bonus: the running-stopping-bending-over combo reportedly burns more calories than a simple run). Their name for it, “plogging,” combines “jogging” and “plocka up,” Swedish for “pick up.” It’s far from a new concept—Leave No Trace advocates have been cleaning up after themselves and others since the backpacking boom. But keeping heavily-trafficked urban parks clean requires constant vigilance. The Middlesex Fells are a perfect example. A jewel of the Greater Boston parks system, the Fells are packed with hikers, runners, dog walkers, and mountain bikers every weekend of the year—and some corners of the reservation’s 2,200 acres have been loved to death. I pulled into one of the last available parking spots at the Fells Sheepfold lot early on a Sunday morning and set out on the green dot trail that parallels Interstate 93. I tucked my plastic bag into the waistband of my tights, not sure when I’d need it. Then before I’d even run a step, I found myself plocka-ing up a scrap of paper. Barely a minute later, a white reflection just off the trail caught my attention: A coffee cup. No more tucking the bag into my pants, I guess. The first mile went by slowly as I stopped every few strides to grab another piece of trash—water bottles, beer cans, cigarette wrappers. One can, half buried in the soil, must’ve been sitting next to the trail for years. A grateful mountain biker said “Thank you” when he saw me grabbing a candy bar wrapper. Fifteen minutes into the run, my bag was nearly full. By then I was turning away from the highway into one of the more remote corners of the Fells, and I was finding less and less trash. I paused as a young deer, his antlers just starting to grow in, crossed the trail. By then I’d settled into the run. The Fells were beautiful, with the sun cutting through the trees and casting shadows across the leaf-strewn trail. I was glad the rate of litter had slowed because I struggled to watch my footing and scan the edges of the trail for plastic at the same time. By the time I’d looped back to the parking area, my bag was full and time had flown by. This was my slowest run in a long time—yet also one of the most satisfying. I’ll write more in the future about running at the Fells because it’s one of Greater Boston’s best trail resources and deserves at least a couple of detailed posts—plus, I’m curious to see if my bag is a little emptier after my next run there. Download a PDF map of Middlesex Fells Reservation.